There was a sale on pork tenderloin, at my local grocery store. Lucky for me, I was there when they still had plenty in stock (and I had room in the freezer). I have only had pork tenderloin once before and I was excited to try my hand at making one. So immediately, I searched the web for information about how to cook this tender, lean meat. The main thing I read was that this meat had a tendency to become very dry and that it doesn’t take long to cook. 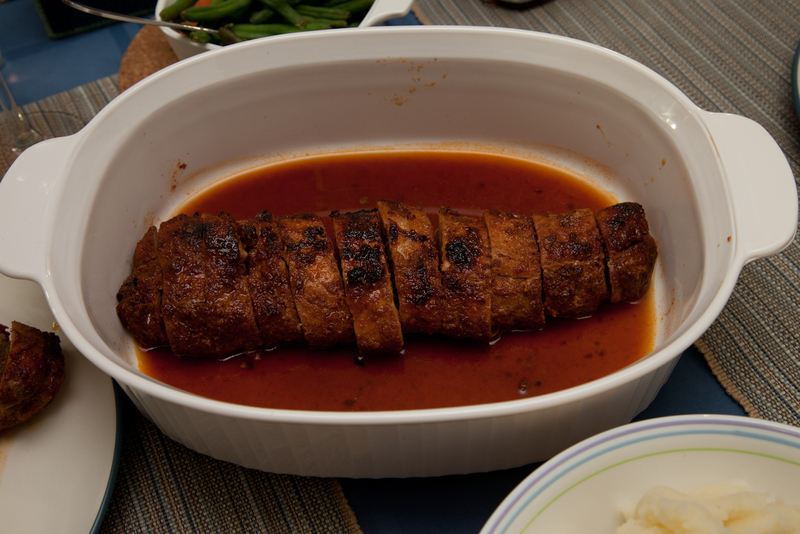 The majority of the websites mentioned that bringing the internal temperature of the meat to 145F and letting the meat rest, was the best way to cook a pork tenderloin. Great, so I have a tentative game plan, now how do I season it? Again, many sources say that any marinades, dry rubs and brining methods work really well on this cut of meat. Great! That opens many doors. Well, I had guests coming over for an early Christmas dinner night. He is an old friend and I got the feeling, that I should make him something sweet and spicy. So, I decided to adapt my Honey Spiced Chicken recipe to a pork tenderloin. It turned out great and really moist! I hope you give it a try! Combine all the spices for the rub and coat both pieces of pork tenderloin. Bake for 20 minutes or until the internal temperature of the tenderloin is 125 F.
Turn on the broiler and glaze the tenderloin with a coat of glaze. Turn over tenderloin and give that size two coats of glaze. Picture captured after one side of tenderloin was already consumed!